Working with leather can be challenging for many home sewists unless they have the right machine and parts and know the tricks involved. All fabrics are different - polyester s-t-r-e-t-c-h-e-s, silks are slippery, sheer fabrics are tricky, and leather has its own set of issues. Some leathers have a reputation for clinginess - that is, they may cling to the presser foot you are using and cause uneven stitching. You can't use pins since once there's a hole in leather it's there forever. Regular sized needles aren't strong enough. The list goes on. The good news is that all of the machines we've reviewed here today can be used for sewing leather and have garnered many fantastic reviews by satisfied customers. Check out the reviews below. We guarantee that one of our selections will turn out to be the very best sewing machine for leather for your particular needs. SINGER 9960 Quantum Stylist 600-Stitch Computerized Sewing: best overall sewing machine for leather. SINGER 4423 Heavy Duty Model Sewing Machine: longest warranty in a budget model. Brother ST371HD Strong and Tough Sewing Machine: best for sewers loyal to the brother brand. Janome HD3000 Heavy Duty Sewing Machine: best heavy duty model for leather (light commercial applications). SINGER Sewing 4432 Heavy Duty Extra-High Speed Sewing Machine: best for light duty leather sewing. Can You Sew Leather With a Regular Sewing Machine? Should I Sew Leather by Hand Vs. using a Machine? The potential exists for being able to sew leather on a home sewing machine if certain conditions exist. Many experienced sewers use a basic presser foot for this type of work, and they are successful. However, if you are having problems with the leather not feeding through properly and sticking to your presser foot, there are a few options that might help. First, get a walking foot (also known as an even feed foot). A walking foot has feed dogs that combine with your machine's feed dogs and can grip leather from both bottom and top to feed it evenly through the sewing machine. Second, you might try a Teflon foot (also called an ultra-glide foot or a non-stick foot). A Teflon foot is usually white and is either coated with Teflon or made of the stuff, and will allow your leather, faux leather, or vinyl to be able to glide through your machine smoothly and not get stick to the foot. Third, try a metal, plastic, or combination roller foot. A rolling foot typically has three rollers - two smaller rollers towards the back and a larger roller near the front - which should work to control the leather's movement and guide it smoothly through your machine without sticking. Next, the density or weight of the leather must be considered. People have had great success sewing thinner pieces of leather on their regular sewing machines. Thicker pieces of leather won't work on many residential sewing machines unless specific adaptations are made. Also, there is a high risk of burning out your sewing machine's motor if you use a thicker leather. Purchase a special leather needle. These needles are available in sewing and craft stores and come in a number of sizes. One of the best sizes for leather work is 100/16. These special needles have a spear-shaped end and will be able to pierce readily through leather. Make sure to change this needle regularly to prevent attempting any task using a blunt needle. You'll need nylon or polyester thread (either regular sized or upholstery sized) if you're going to sew leather. Synthetics are durable and strong, and you can even melt the raw ends into the seam-end for sealing). Stay clear of using plain cotton thread since it may react with the tannins present in leather and could dissolve over time. Using pins to hold the leather in place is a very bad idea. They will make permanent holes in the leather. Use binder clips or fold back clips to keep your leather layers together. Try the clips out first on a leather scrap to make sure that they don't have any sharp edges that can scratch or cut the leather. An alternative is to use double-sided tape to keep the leather layers together. Double-sided tape can be used either in multiple shorter pieces spaced a few centimeters apart or in long strips. (Note: Don't place tape right underneath the stitching line since the tape's glue may get transferred onto the needle and fed into the machine). It's best to use a long stitch length whenever you're sewing leather. Sewing machines vary, of course - just make sure that your stitch length is approximately 1/8" (3 to 4 mm) long. If your stitch is any shorter, it can perforate and tear your leather. Sewing leather is fun because its raw edges don't need special finishing and don't fray. However, a little topstitching will help your projects to lay flatter. Make sure to trim the side of the seam allowance that your topstitching is meant to cover up. This allows both the seam to be flatter and also helps to reduce bulk. If you have a thick leather seam or 3+ layers of leather that is too high, you can reduce its height by a little hammering. Make sure to cover the leather first with a clean cloth before you start tapping. Instead of backstitching to secure your thread ends like you do when sewing regular fabric, use a knot to secure your threads at the start and finish of every row of stitching. If you try to sew back and forth over a piece of leather, there is a high potential for possible tearing, splitting, and perforation. You are probably accustomed to sewing with regular fabric which allows you to unpick and redo without worrying about the original stitching line leaving any holes in the material. That won't work with leather. You will need to concentrate on what you're doing and take your time. If you're finding the sewing difficult, try either changing the needle, guiding the fabric as straight as possible, or doing a little seam hammering. The sewing machines that are reviewed here today range from $118 to $2,499, with most falling in the $250 to $650 range. If you are looking for an entry-level sewing machine that will be right for occasional projects using faux leather or thinner leather, then you should look in the $120 to $300 range. If you're planning on sewing with heavier leather, you'll want to look at a machine that offers more features and a higher footer, putting your purchase in a middle range of $350 - $700. Finally, if money is not an object, and you want a workhorse of a machine with all the bells and whistles, you can expect to pay between $1,000 and $2,500 and upwards. The most important thing to remember when you're sewing with leather products is that you must at all cost avoid using cotton thread. Cotton thread will rot as time passes and your seams will fail. Bonded-nylon thread is a very strong thread that has gone through a bonding process of resin coating to reduce friction and add strength. This type of thread comes in an assortment of weights to go with different thicknesses and weights of leather, and will definitely contribute to faster and smoother sewing on a machine. Keep in mind that these threads should not be used for leathers that will be exposed to ultraviolet rays for long periods of time since UV rays can degrade the nylon. Upholstery weight bonded polyester threads are an excellent choice for leather projects. It's available in a number of thicknesses, and it has a better resistance to ultraviolet rays than nylon. Be aware that bonded polyester threads aren't quite as strong or durable as nylon. If you want to use the best thread on the market for sewing leather, choose DuPont Kevlar Thread. It's 2 1/2 times stronger than either polyester or nylon, has practically no stretch, doesn't melt, and is fire retardant up to 800º Fahrenheit. The answer to this question depends on a number of variables. Probably the most important variable is time. Sewing leather by hand can be one of the most time-consuming endeavors ever! If you have time to burn, then hand sewing leather will be your most cost-effective option. Do you just want to do one or two projects with leather and can't foresee doing more in the future? That's a no-brainer for doing the jobs by hand. But if you are interested in doing a lot of light leather projects, a good residential sewing machine can be just the ticket. If you're committed to working with lots of thick leather, you should invest in a more heavy duty industrial machine. Why You Should Buy It: This machine is the finest, most comprehensive, most economical product in the marketplace today. We rated the Singer 9960 Quantum Stylist Computerized Sewing machine 5.0 out of 5 stars and is a very impressive machine with an outstanding amount of unique features. This portable machine offers an incredible 600 built-in stitch patterns, 5 alphanumeric fonts, mirror imaging, 13 automatic 1-step buttonholes (including Singer's exclusive buttonhole underplate) and fully customizable stitch elongation options. It makes sewing leather a breeze with its automatic stitch width and length, fast and easy threading, extensive stitch editing capabilities, direct-button stitch selection, and start/stop button. This economically priced sewing machine weighs 18.2 pounds and measures 17"L x 8.25"W x 12"H. You'll experience easier, faster sewing with this machine's speed control, electronic autopilot, and automatic 1-touch thread cutter. It has an extension table perfect for extra large sewing projects like quilting, a digital information advisor which provides information on selected width and length settings, built-in stitches, and recommended presser foot on a clear, legible LCD screen. Why You Should Buy It: This machine is a workhorse and provides everything a basic beginning sewist or a more experienced sewist will need. The Singer 4423 Heavy Duty Sewing Machine provides an incredible super-high sewing machine speed of 1,100 stitches a minute! This machine offers 23 built-in stitches, including 4 stretch stitches, 6 essential basic stitches, and 12 decorative stitches, which complement its easy-load drop-in bobbin system perfectly. It also features a heavy-duty interior metal frame that guarantees stillness for skip-free sewing, in addition to a smooth even fabric feed that is ideally suited for home decor, crafts, leatherwork, clothing construction and more. This quality, inexpensive, versatile machine comes with an automatic needle threader and powerful 60% stronger motor and is an excellent choice for sewing all manner of materials, including leather. This machine weighs 14.5 pounds and measures 15.5" x 6.2" x 12". It features an entirely automatic one-step buttonhole. Included with this machine are 4 presser feet, including a zipper foot, button sewing foot, buttonhole foot, and an all-purpose foot. Assistance, tutorials, and frequently asked questions are available using the Singer Sewing-Assistant app, which can be downloaded from iTunes or Google Play. Video tutorial topics include Installing a Bobbin, Threading, and Presser-Feet Training. Why You Should Buy It: Great heavy duty machine to help you sew most leather projects at an affordable price point. This machine is extremely versatile and is perfect for both everyday tasks as well as thick seams and leather. The Brother ST371HD Strong & Tough Sewing Machine is rated 4.5 out of 5 stars (by us) and is a durable, dependable, and versatile machine that has been specially designed to handle a broad range of fabric thicknesses and weights. The ST371HD tackles leather, outdoor material, and lightweight silks. Some of its other heavy duty features include heavyweight needles, a metal thread hook, a metal needle plate that provides smoother feeding, a spring-action zigzag foot ideal for thick seams, and a special non-stick foot for suede and other similar fabrics. Some of the excellent features of this machine are that it comes with 37 unique built-in stitches, six quick-change sewing feet including decorative, blind hem, stretch stitches, zigzag stitches, and an auto-size one-step buttonholer that provides virtually perfect buttonholes. In addition, the Brother ST371HD has a drop-in quick-set top bobbin, built-in needle threader, a maximum sewing speed of 800 stitches per minute, and a bright LED work area. This high-quality machine weights 18.4 pounds and weighs 10.2" x 18.9" x 14.9". It is strong enough to sew the thickest seams, leather, and tent fabrics, hem jeans, and is also just right for everyday mending and sewing projects. It's great for sewing stretch-stitches for knits, invisible hems, and reinforcement stitches. A spring-action zigzag foot provides smooth sewing over various thicknesses of fabric. The non-stick foot handles vinyl, leather, suede, and loop tape. Why You Should Buy It: This heavy-duty machine sews through fabrics of all thicknesses with ease and is perfect both for beginning sewists and more eclectic sewists. We rated the Janome HD3000 Heavy Duty Sewing Machine 4.5 out of 5 stars and is a top-of-the-line higher quality machine. Sewists appreciate its automatic built-in needle threader, top-loading jam-proof bobbin system, and simple stitch selection. A user needs only to turn the stitch-selection dial to whatever stitch is desired and the stitch chosen will immediately appear in red on the flip-up stitch panel. A turn of the dial automatically adjusts presser foot pressure. The Janome HD3000 has free arm capability which makes sewing shirt sleeves and pant legs a snap. This machine weighs 23.5 pounds and measures 19.2" x 14.5" x 11.4" and provides excellent quality sewing of a broad assortment of fabric thicknesses. It comes with a large amount of accessories, including an ultra glide foot, a hardcover case, 1 pack of universal-needles and 2 packs of leather needles, one pack of bobbins, an overedge "C" foot, a blind-hem "G" foot, a rolled-hem "D" foot, a buttonhole "B" foot, and a zipper "E" foot. In addition, this more expensive machine is equipped with an automatic-buttonhole "R" foot, 1 small screwdriver and a regular sized screwdriver, one pack of needles, 1 small and 1 large spool holder, a lint brush, additional spool pin, seam ripper, bobbin, felt, quilter bar, power cord/foot control, and an instructional manual and warranty card. Why You Should Buy It: This machine handles multiple jean hems and leather bags using the proper feet and needles. We have rated the Singer Sewing 4432 Heavy-Duty Extra-High Speed Sewing Machine 4.0 out of 5 stars and is a workhorse of a machine. This sewing machine weighs 15 pounds and measures 15.2" x 6.2" x 12" and is both versatile and easy-to-use. It features a timesaving automatic needle threader, a speed of 1,110 stitches a minute, and a clear view covered top drop-in bobbin. The 4432 has a unique stainless-steel bedplate, a 60% stronger motor, and a robust metal frame that keeps all mechanisms in complete alignment for overall durability and skip-free sewing. The Singer 4432 has a completely automatic 1-step buttonhole, a Singer Sewing-Assistant App available from Google Play or iTunes, and a plethora of included accessories. The accessories include a zipper foot, buttonhole foot, all-purpose foot, seam ripper and lint brush, bobbins, needles, quilting guide, soft-sided dust cover, foot controller, instruction manual, quick start guide, and much more. This machine comes with 7 stretch stitches, 6 basic stitches, 18 decorative stitches and an automatic buttonhole which can be used on multi-layers of material. It is a box feeder, which means that the feed dogs move fabric using continuous pressure on fabric instead of moving down and up in an arc. This feature is particularly important when sewing either very thin or very thick material. An adjustable feed gives a sewer the choice of amount of pressure or feed. A foot pressure adjustment allows sewers to choose exactly how hard a pressure foot will set down on fabric. Why You Should Buy It: This machine was specially designed for marine heavy-duty canvas workers and can sew through 10 layers of canvas. We rated the Sailrite Ultrafeed Heavy-Duty LS-1 Walking-Foot Sewing Machine 5 out of 5 stars and is one of the finest, most luxurious machines on the market today. This is a straight-stitch walking-foot machine that sews through the heaviest materials, including canvas (up to ten layers), leather, and upholstery fabrics. It features a patented Posi-Pin clutching-system which allows 100% power transfer from needle to balance wheel. This upper-end machine weighs 55 pounds and measures 18" x 16.5" x 14" and possesses many must-have features, like a high 3/8" foot-lift, an extra-wide presser foot with built-in piping tunnel, and a variable stitch length of 0.23622" (6mm). It is a perfect introductory machine for sewists who want to sew many-layered home projects, automotive and RV upholstery, or boat canvas. Its powerful motor is a match for sewing heavy upholstery, home decor fabrics, and soft leather. The Sailrite Ultrafeed Sewing Machine comes with a power-plus balance wheel, an Ultrafeed wooden base, an electronic foot-control, an EZ-Set Stitch-Length Plate, sewing machine oil, a thread stand, four #20 needles, four bobbins, a guidebook, toolkit, and an "Ultrafeed Set-up, Maintenance, and Use" DVD. Why You Should Buy It: This machine offers durability, power, and speed, and is a perfect choice for sewing leather and other heavyweight materials. We rated the Juki DNU-1541 Servo Motor Industrial Walking Foot Sewing Machine 5 out of 5 stars and is a powerhouse of a straight stitch, single needle sewing machine. This machine has been specially constructed to sew all heavy weight fabrics. Fabrics like leather are easily sewn using the Juki DNU-1541's rectangular feed, higher needle stroke, and walking foot technology. The DNU-1541 weighs 250 pounds and measures 48" x 36" x 48". Its servo sewing motor makes this unit extremely quiet and perfect for all in-home uses. This industrial strength unit comes with machine head, stand, table, motor, drawer, sewing light, all installed and at your fingertips. It features a maximum sewing speed of 2,500 stitches per minute and a maximum stitch length of 0.354331 inches (9mm). It runs on a 110V that has a whisper-quiet servo-motor. Just remember to oil the motor and clean the machine properly, and it will provide a practically flawless performance for many years to come. Why You Should Buy It: This superior machine quilts, sews, works well with leather, and has all the extras a professional sewist could desire. The Janome 8200 QCP Memory Craft Horizon Computerized Sewing machine With Extension Table is is a top-of-the-line machine with all the bells and whistles that an experienced sewist will ever need. This machine features an Acufeed Flex feeding system for superior feeding of both bottom and top layers of fabric, making it an excellent choice for delicate fabrics, large quilts, leather, etc. Sewists can choose from more than 200 stitches, including numbers, alphabets, and 7 different types of automatic buttonholes. Patterns can be shortened or elongated as much as 5 times the standard length. It also has a speed-controller to set maximum sewing speed, an automatic needle threader, and a start/stop button if the user chooses not to use the foot-control. The Janome 8200 QCP Machine has a needle down/needle up button which allows the needle to finish in either the fabric or in the up position, which is great for pivoting on corners. Why You Should Buy It: This machine has 11 built-in stitches and 4 presser feet and comes with a 25-year limited warranty. We rated the Singer 4411 Heavy Duty Sewing Machine With Stainless Steel Bedplate Metal Frame 4.5 out of 5 stars and is a robust, versatile and easy-to-use machine. It features a timesaving automatic needle threader, as well as a speed of 1,100 stitches a minute, which allows users to bring their ideas to life quickly. The Singer 4411 weighs 14.5 pounds and measures 15.5" x 6.2" x 12". With a heavy-duty metal interior frame, stainless steel bedplate, extra-high sewing speed and powerful motor, the 4411 Heavy Duty can sew through just about anything you throw at it. It has many convenient features like a drop-feed for free motion sewing, a top-drop-in bobbin with a transparent see-through cover, an adjustable presser-foot pressure that makes sewing lightweight or heavy fabric a breeze, and an automatic 4-step buttonhole. This machine is ready to assist with all new projects and garment alterations. It has a unique stainless-steel bedplate that guarantees smoother fabric feeding, a 60% stronger motor, and a workhorse heavy-duty metal frame that keeps all mechanisms in complete alignment. Its many accessories include an all-purpose foot, buttonhole foot, zipper foot, button sewing foot, quilting guide, seam ripper and lint brush, bobbins, needles, auxiliary spool pin, screwdriver, spool pin felt, foot control power cord, instruction manual, and a soft-sided dust cover. Why You Should Buy It: This reasonably priced versatile machine is a workhorse and handles heavy upholstery fabrics and thin sheer material equally well. 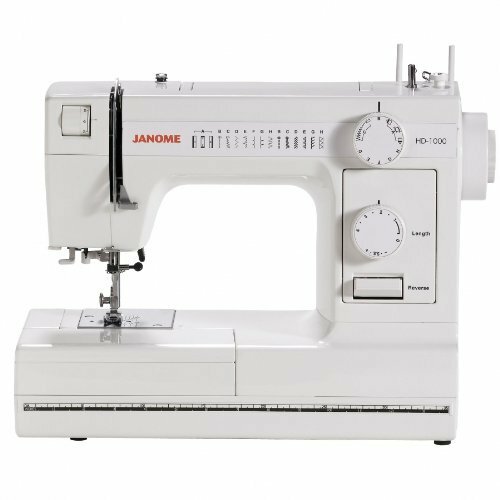 Machine requires at least 6" of end thread instead of the usual 3-4"
The Janome HD1000 Heavy Duty Sewing Machine is an economical machine with a consistent performance sewing a wide variety of fabrics. This sewing machine is constructed of cast aluminum, has a powerful amp motor, has 14 built-in stitches (including stretch stitches, utility stitches, basic, quilting, fashion, and home decor stitches, plus an easy-to-use 4-step buttonhole) and is constructed to last a lifetime. This machine weighs 23.1 pounds and measures 18.2" x 8.5" x 15". Its rugged aluminum body construction is just what the professional sewist is looking for to sew a broad range of fabrics. It features a built-in needle threader, a drop feed feature for quilting and free motion sewing, and a removable free arm that allows hemming pants or sewing smaller openings like sleeves. The Janome HD1000 has a three-piece feed-dog system that facilitates a smooth fabric feed, including quilt materials, leather, and high-pile fabrics. It has an adjustable zigzag width and stitch length (just turn the dials!) and includes an attractive hard-sided cover. In addition, this quality machine comes with 4 presser feet and many free accessories, a front loading vertical oscillating-hook bobbin, an automatic-declutch bobbin-winder, an easy reverse lever, manual thread tension-control, stitch selection dial, and an extra-high presser-foot lifter. After researching and comparing hundreds of sewing machines, and reading a similar number of reviews, we ended up with a list of what we consider the top 10 sewing machines on the market today that can be used to sew leather. We took into consideration stitch editing capabilities, presser feet, price, ease of use, weight, versatility, and a number of other variables. Our editor's choice for the best available sewing machine for leather is the Singer 9960 Quantum Stylist 600-Stitch Computerized Sewing Machine. 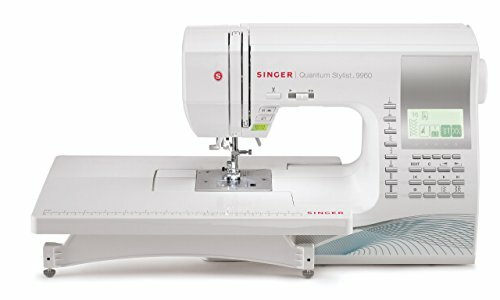 The Singer 9960 is reasonably priced ($350) and comes equipped with 600 different stitch patterns, automatic needle threading, mirror imaging, customizable stitch elongation options, fast and easy threading, and so much more. This sewing machine shines in all styles of sewing and has been praised for its facility with leather work. Both beginners and professionals will find this sewing machine to be indispensable. This extraordinary machine has a powerful DC motor that makes working with thicker materials easier. It has a hinge on its general presser foot that can be locked in place whenever you're sewing through a very thick seam. It has an amazingly smooth fabric feed, well constructed and powerful feed dogs, and even provides an extension table that is invaluable when working or larger or unwieldy projects. 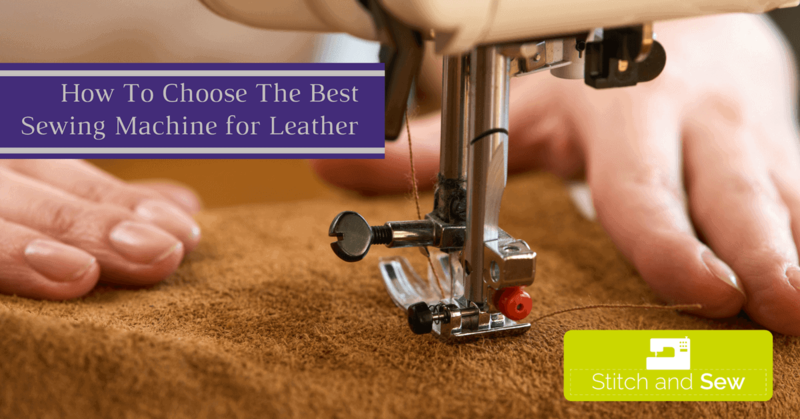 Many thanks for checking out our list of what we consider to be the best sewing machines for leather projects available in the market today. Good luck in all your sewing endeavors!